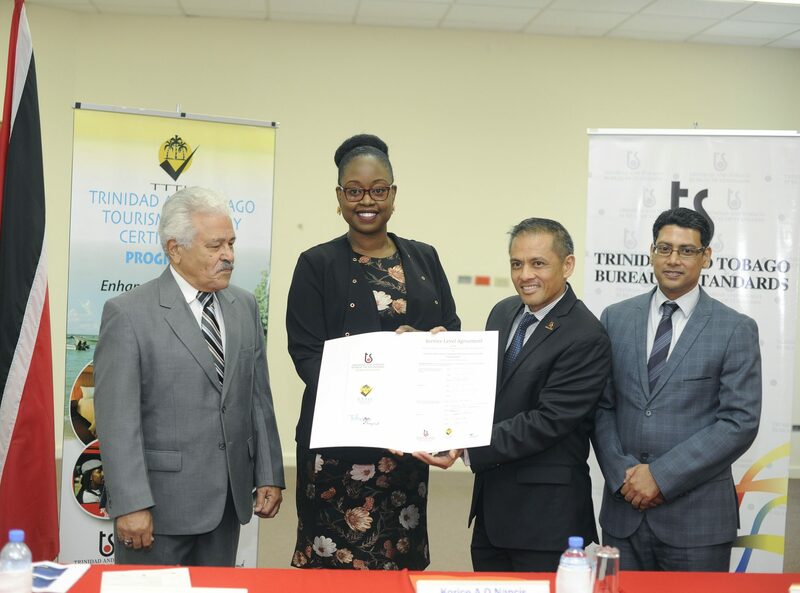 On 26th November 2018, The Trinidad and Tobago Bureau of Standards (TTBS) and the Tobago Tourism Agency Limited (TTAL) signed a one year Service Level Agreement (SLA), at Central Administrative Services in Scarborough, Tobago, to relaunch the Trinidad and Tobago Tourism Industry Certification (TTTIC) programme on the sister isle of Tobago. Provide an assurance to visitors that relevant legal requirements, basic levels of quality, health and safety have been established. These standards set minimum requirements related to the product and/or service including where applicable those related to regulations, infrastructure, equipment, competence and management. TTTIC, is the first and only tourism certification programme in the Caribbean, developed and jointly executed by a National Bureau of Standards and a Tourism Authority. Under the programme, TTAL will provide support and guidance to the applicants by helping them to navigate through the processes of certification and standard implementation. Speaking at the event, Nancis, said the signing ceremony highlights the commitment of both parties to transform the delivery of service in the tourism sector. Speaking on the importance of standards within the tourism sector Lawford Dupres, Chairman of TTBS, said the SLA would reenergize all stakeholders involved in the Tourism Industry. The TTTIC is an ideal way to showcase to the world that you offer quality tourism products and services. Obtaining certification will mean that your business practices have a platform to ensure that as a tourism operator you conform to the national standards of quality in your operations. Tourists and businesses are encouraged to look for certified tourism operators which can lead to repeat business, increased revenue and recognition as a professional in the field.